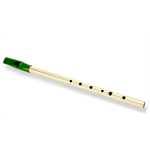 The Feadog pronounced fa dog (Gaelic for whistle) is the best available genuine Irish Penny Whistle imported from Dublin. This plastic wind instrument is the ideal first step to learning about how breath and fingers work together to create music. The lightweight body and molded finger holes and mouthpiece make holding and playing the flutophone easy for any musician. Fisher Price Toys- The iconic Changeable Disk Camera, originally introduced in 1968, is back for a new generation of children to enjoy. This adorable camera features interchangeable picture disks that are advanced by pressing the "shutter" button. Introduced in 1961, The Chatter Telephone was the ultimate pretend play toy with its ringing rotary dial and its friendly interactive design. 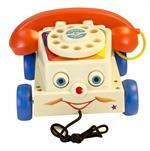 Since then, technology has changed quite a bit, but the Chatter Telephone makes children smile just the same way. Introduced in 1968, the Fisher-Price Music Box Teaching Clock has made learning to tell time fun for generations of children. 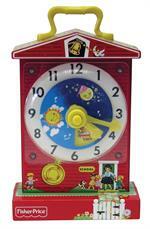 Designed as a little red school house, the Fisher-Price Classics Music Box Teaching Clock plays Grandfather's Clock. The Fisher Price Change-A-Record Music Box, more commonly known as the Fisher Price Record Player, is a favorite among those who played with it as a child. Originally introduced in 1971, this endearing classic is now available again. New in box. A fun vintage musical instrument provides hours of fun. Learn sounds, jigs, and songs withour easy-to-understand instructionbooklet. Reproduction of the 1962 AstroRay Blaster. The fate of the universe is in your hands. 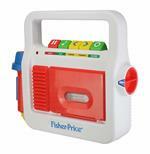 Includes 4 safe foam darts and light up features. Morse code signals on handle. Light targeting dart blaster. Requires 2 AA batteries, not included. 24 key electronic keyboard. 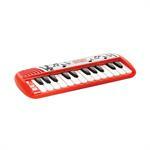 Compact size allows little musicians to bring this keyboard almost anywhere. Features 14 demo song, plus Piano, Trumpet and Organ sounds. Requires 2 AA batteries. Includes 24 Keys. Compact Size. 14 Demo Songs. America's favorite family TV game show is back! family Feud features multiple rounds of play that include fast money, double and Triple points play! the object of the game is to try and guess the most popular answers to audience surveyed questions. Mini arcade game with authentic arcade sounds and style joy stick that plays like the real Pac-Man ! With two cool play modes, you can move the joystick around to eat the dots and eat and run! Ding, ding, ding!!! Can we help you? 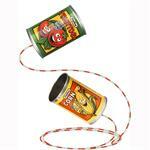 This fun little Service Bell is the perfect addition to playtime fun. Clear the way with a heck of a honk by squeezing the rubber ball on the Bike Horn. It makes an unmistakable noise that lets all know you're coming. The Bike Horn easily fastens to any bike's handle bars with an adjustable clip. The jester jack in the box, a schylling original, from schylling toys the world leader in traditional toys and classic fun, will be sure to bring a smile. The jack in the box has been bringing joy to children for generations. 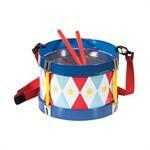 Lead the band with a strong beat on this classic tin drum! With an adjustable strap and two wooden drumsticks you are sure to never miss a beat! Colored balls bounce around inside the drum as you play. Measures 7.5 x 7.5 x 5.5 in box. Ages 3 & up. 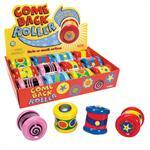 Sure to amuse the little ones, the Come Back Roller is tons of fun! Gently roll them away and watch as they roll right back! Measures 3 x 2.75 x 2.75 Ages 18 months and older. One roller per purchase. This small wooden guitar is decorated with a western scene. It has 6 nylon strings. It has a slotted neck, plastic tuning pegs and detailed tuning instructions. It measures 22" tall. Fun Western, Cowboy themed design. 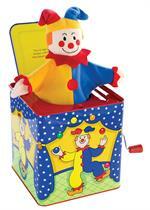 Our classic tin Jack in the Boxes are a great addition to every child's toy chest. They're sure to bring a smile to every child's face. 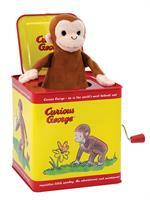 Each tin box is a little over 5' tall and has a plush puppet Plays 'Pop Goes the Weasel'. 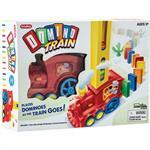 Chug your way into fun with our domino train! Fill the cartridge and start the train to lay your domino trail. For ages 3 and up.